This is the first part in our tutorial series. In each part we will focus on a different feature or aspect of Brainsbuilder functionality. In this part we will look at ‘login sections’ and ‘login questions’ sometimes refereed to as ‘login fields’ and in the next part we will focus on a particular type login question called ‘key questions’ sometimes also referred to as ‘key fields’. If you at all familiar with Brainsbuilder you will understand that all questions must be in a section. Login sections are similar to normal sections, but the major difference is that the login section and questions for login sections can be created automatically from a standard list of questions. These are “Email” and “Name” that uniquely identify the person taking the assessment and other questions such as “Gender”, “Age” etc that put the person taking your assessment to a demographic. You can also add you own login questions if your question is not in the list. There are also a few other differences between regular section and login sections. Lets look at these differences. 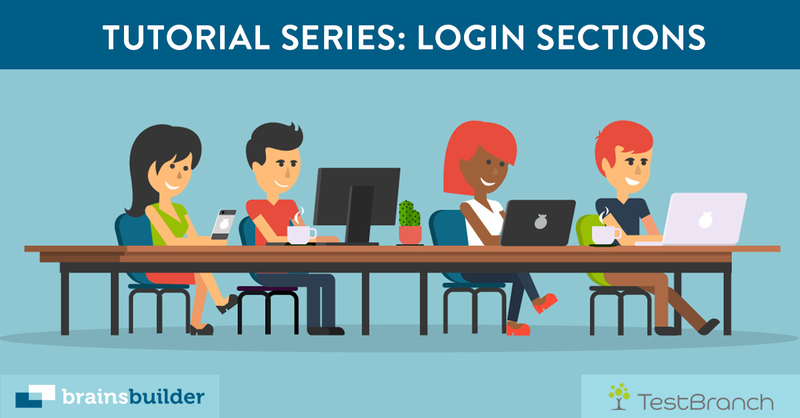 Login sections must be the first section of an assessment. This makes perfect sense as it is not logical to log in at the in the middle or at the end of an assessment. Login section cannot have scoring questions. This also makes sense as the login section should be used for questions that identify your user either uniquely or demographically. Key questions can only be in the login section and no other section. Key questions are special type of login questions that uniquely identify the person taking your assessment and are used in the rest of the application to identify your users. Key questions are an important concept in Brainsbuilder we will look at these in more detail in the next part. To create login section when creating an you will be presented with the “Login Section” stage after the initial settings. You can add login sections after the assessment is created by going to “Edit Assessment -> Add Login Section”.